Astronomers find Largest Water Reservoir Ever! This is super cool! Astronomers using a pair of sub-millimeter wavelength telescopes discovered the largest reservoir of water ever found in the Universe. The water-containing cloud was found near quasar APM 08279+5255, some 12 billion light years from Earth. This means that the radiation seen today from this quasar was emitted when the universe was a scant 1.6 billion years old. Calculations have placed the mass of water vapor in the cloud at approximately 100,000 solar masses, or 140 trillion times the mass of all water on the planet Earth. At the center of APM 08279+5255 is a super massive black hole that is 20 billion solar masses. It puts out more than 65,000 times the energy that the entire Milky Way does. This energy is seen in the form of infrared and X-rays, and it allows astronomers to ask questions about the nature of the black hole and the surrounding dust and gas cloud. 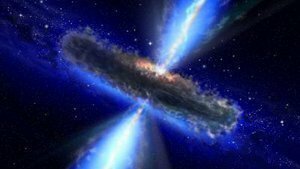 Analysis of emissions from the water vapor, for example, gives astronomers an idea of how the radiation from the quasar is heating the surrounding gas. The vapor cloud spans several hundred light years. Given the size, calculations indicate that the water vapor is dense when compared to many other astronomical vapors—it is about one to two orders of magnitude denser and about 5 times hotter than water vapor found in a typical galaxy. However, the water vapor found in the Earth’s atmosphere is 3×1014 times the density of this material. Based on the other molecules observed in the cloud, the researchers estimate that it contains enough matter that, if it were all devoured by the black hole, it could grow to six times its already super massive size. Next Bid to Block Human Embryonic Stem Cell Research Fails!